Classical limit theorems such as the law of large numbers, the central limit theorem and the law of the iterated logarithm are statements concerning sums of independent and identically distributed random variables, and thus, statements concerning random walks. 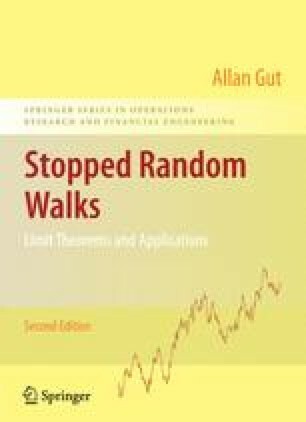 Frequently, however, one considers random walks evaluated after a random number of steps. In sequential analysis, for example, one considers the time points when the random walk leaves some given finite interval. In renewal theory one considers the time points generated by the so-called renewal counting process. For random walks on the whole real line one studies first passage times across horizontal levels, here, in particular, the zero level corresponds to the first ascending ladder epoch. In reliability theory one may, for example, be interested in the total cost for the replacements made during a fixed time interval and so on.